TeacherEase is a learning management system (LMS) for technology-rich K-12 classrooms -- especially 1:1 computing, BYO programs, or frequent users of laptop carts. It helps teachers move through the technology adoption curve. This page discusses benefits for teachers new to technology in the classroom. Initially the biggest challenge is learning to integrate technology into instruction and use the devices every day. Their activities often fall into the 'enhancement' level of the SAMR model, and is a practical way to get started. Student motivation and teacher productivity increases. Student achievement is likely to see modest improvement. Many teachers initially struggle in technology-rich classrooms. In spite of professional development, they're often unclear how to use new laptops or tablets to achieve educational goals. 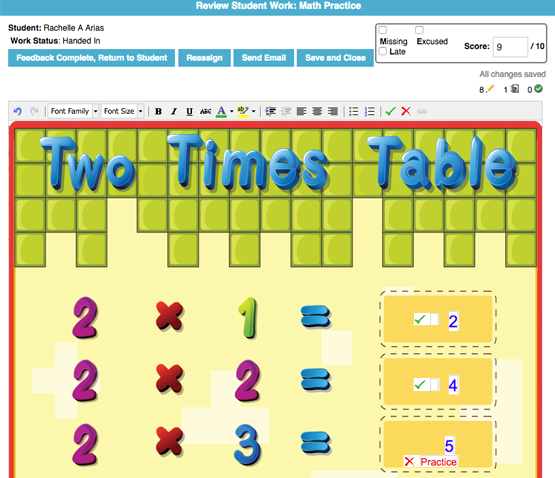 TeacherEase helps by providing software that scaffolds the process for teachers. Teachers set up digital activities and students work electronically. Manage the entire learning cycle online. Differentiate student activities. Give reinforcement to students needing remediation. Give extensions to students who need additional challenge. Tailor activities to individual students' learning modes. Think of each computing device as a digital teacher's aide. As teachers build or find good digital resources for their classroom, they organize it into curricula. 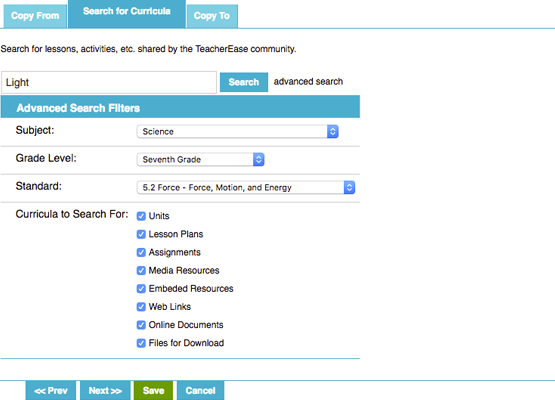 TeacherEase provides a great place to collect the units, lessons, activities, assessments, etc. They can store web pages, videos, electronic documents, online quizzes, files, and anything else used in the classroom. It provides a software platform to run the digital classroom. Many schools have stopped buying traditional textbooks, and digital curriculum is taking its place. Students carry a single device instead of heavy paper textbooks. Digital curricula can be easily given to students, which is more fun for them. When interacting with digital activities, students often don't perceive it as 'work.' Achieve higher student motivation and increased learning. Common Core State Standards are tightly integrated into TeacherEase. 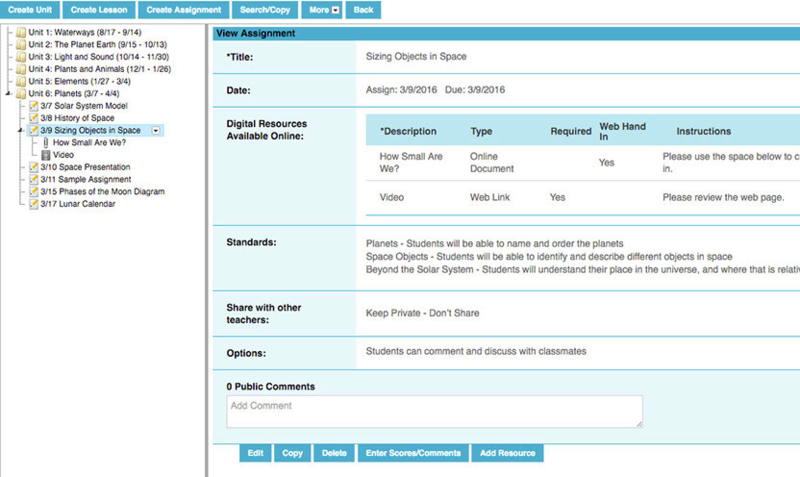 Align any curricular item to the CCSS and easily track their usage. Students in technology-rich classrooms are supposed to be more engaged and productive. TeacherEase provides a status console to monitor students' current activity. This helps teachers keep students on-task and identify students who are struggling and need help. Teachers can scan and upload their existing paper resources. Preserve and migrate excellent activities that have worked for years. Provide touchstones for teachers who aren't yet comfortable with technology. Help teachers get started by searching our database of digital curricula. Find resources used by other teachers and rated by the TeacherEase user community. Have a great resource? Share it with colleagues or the entire community. By moving student work online, greatly reduce the use of paper. Districts have traditionally spent 5-8% of their budget on textbooks, consumables, and photocopying. Implementing technology-rich classrooms can reduce paper costs and help the environment too. As teachers start to use redefining activities, they’re transforming education. TeacherEase makes it easy to spread the use of transformative practices within the organization. With increased use of redefining activities and transformation, student performance can improve significantly. Research shows that schools using these new practices get better educational results. Built in activities focus heavily on 21st Century skills like communication, collaboration, initiative, self-direction, accountability, and technology literacy. These skills are taught and learned naturally by using TeacherEase. Flipped classrooms and the use of independently accessible online resources make better use of classroom time. By asking students to watch videos at home (or consume other digital activities), TeacherEase allows students to do their “homework” in class. The teacher is free to interact with students while they’re working, since they aren’t constantly lecturing. They have more time for individual student attention and better meet each student’s unique needs. TeacherEase is a single product for teachers at all levels of technology adoption. It supports enhancement for new technology-rich classrooms and transformation for more developed classrooms. 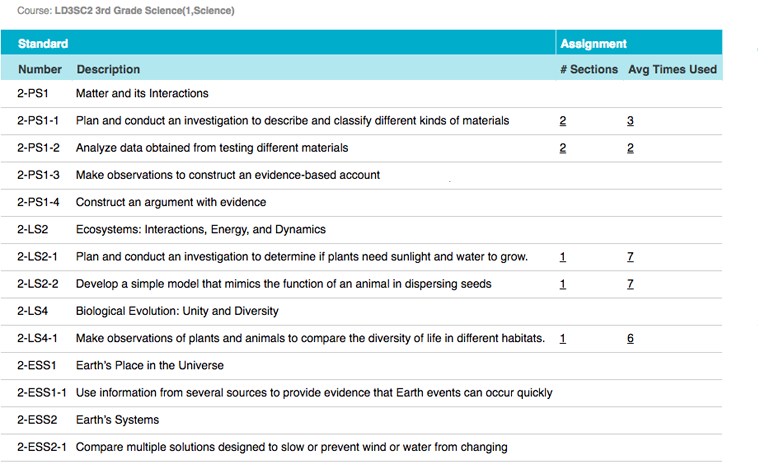 Create units, lesson plans, and assignments. Attach digital resources and assign standards. Plan the scope and sequence of curricula for the students. Teachers can use all manner of digital activities in the classroom. Give students web pages, videos, rich interactive media, online worksheets, quizzes, or any other digital activity. Use any digital resource that functions properly on their devices. 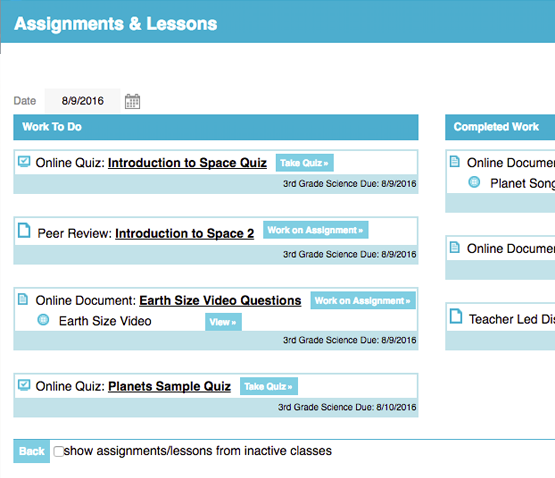 As teachers build lessons and assignments, those activities are automatically added to students' task lists. Students see all their work in one place and self-manage their efforts. Help students develop time management skills and executive function. Students have a consistent area to access digital resources. They're inside the learning environment while they're reading web pages, writing online documents, working on quizzes, etc. This is easy for students and prevents them from losing documents, saving in the wrong place, etc. They can also upload documents they have authored outside TeacherEase. TeacherEase provides a collaborative environment for the classroom. Students can ask questions and comment on learning activities. Teachers view student progress on their task lists to better manage classroom effort. See which activities students are currently working on, which ones are completed, and easily monitor idle time. Walk over to students who may be struggling or distracted. Push enrichment/entertainment activities to students who've completed work. After students have completed work, they can hand it in electronically. Go paperless, work from anywhere via the Internet, and lighten everyone's bags. Teachers mark-up student work, provide feedback, and give grades electronically. No need to carry papers home. Specifically designed to allow easy and fast workflow, looks just like grading traditional papers. 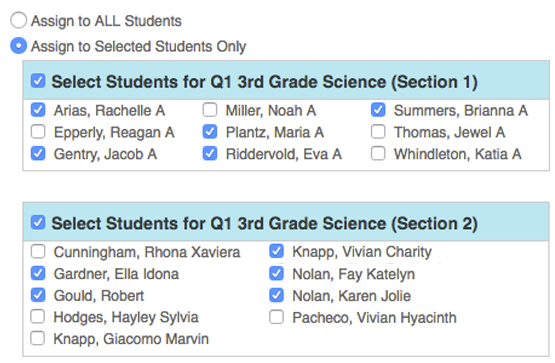 Grades flow automatically into the TeacherEase gradebook. Once students complete activities, publish them to the rest of the class. Classmates can comment and provide feedback. Encourage knowledge sharing and peer review. Take online quizzes a step further and use them as learning activities. Allow students access to hints, answers, and resources to help them better understand the material. Turn quizzes into repeatable educational resources that students can independently use to build competence. Engage students with in-depth discussion and debate. By giving students time to formulate better responses, class discussions can continue throughout the day and result in much deeper levels of understanding. Involve shy students who may not be comfortable speaking up in class. Students and parents can login and view returned work. Students get their feedback. Parents can see progress and become more involved in their students' education. Viewing actual work and teacher feedback increases the fidelity of information provided to parents. 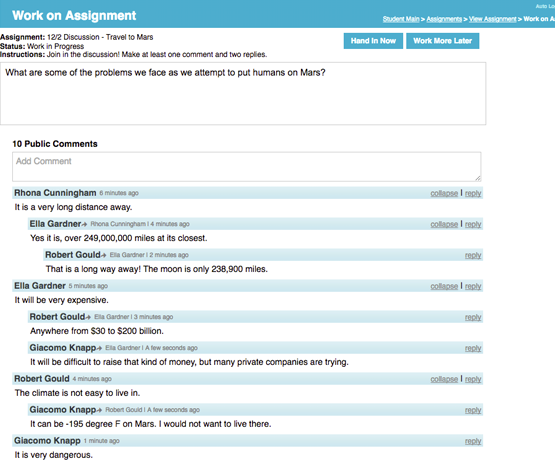 Assignments can be given to individual students or the whole class. Teachers can easily individualize instruction. They can provide reinforcement activities for struggling students (potentially tailoring learning mode for each student). They can provide challenging extensions to students who move at a faster pace. For electronic documents, TeacherEase includes an online rich-text editor. It's also compatible with iPads that don't easily support download/upload. Upload digital copies of familiar paper worksheets. Students can answer the questions directly through TeacherEase. There's no need to download and upload or print. Share curriculum with the TeacherEase community to be rated and searched by other instructors. This is especially helpful for teachers just getting started. 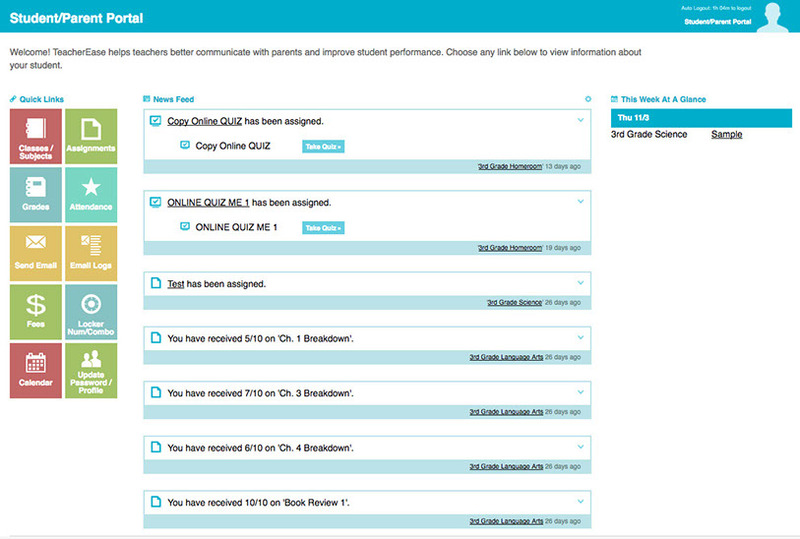 Easily administer online quizzes to students. Pre-assess student skills and checkpoint skills throughout a unit. Allow students to take practice quizzes to gauge understanding. Provide 'clicker' quizzes to guide instruction during lessons. Create question item banks and align to the Common Core. Today, master teachers collect filing cabinets of excellent paper activities to supplement textbook materials. They replace weak textbook content with better alternatives. They find resources better suited for individual students. TeacherEase provides a structure to organize, use, and share these digital resources. Spread the wisdom and knowledge accumulated by the staff. Align content to the Common Core or other standards. Run coverage reports to verify that all standards have been taught. TeacherEase provides a platform to give and manage projects. Each group can receive individualized resources and instructions. Each step of the process can be managed and graded: inquiry, drafts, revision and reflection, and the final product. Upload recorded lessons and materials (videos, podcasts, powerpoints, handouts, etc. ), and let the students learn at home. In class, students can ask questions, work on assignments, and even help each other. Take flipped classroom further by allowing students to progress through the lessons independently. Truly become the 'guide by the side' as each student works on material at their own pace.